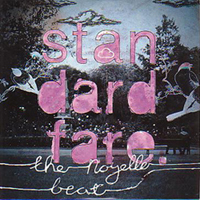 As proudly pop as it is fiercely raucous, Standard Fare’s The Noyelle Beat sounds like the Pretenders by way of the Promise Ring. The Sheffield act spends the album, its debut, successfully toeing the line between mathematical guitar aggression and twee softness, a marriage most prominent in sometimes-singer Emma Kupa’s unhinged but never unmelodic alto. It’s lo-fi but in the genre’s classic sense: low-budget and simply arranged and performed rather than buried in a trendy reverb-fuzz coffin. The poppier moments lend heart to the guitar crunch and crashing drums, but even at its lightest, the band never slips below Speed Racer BPMs. Lyrically, Standard Fare stick mostly with love stories: an underage infatuation, a lover’s hoped-for return, narratives told with naivete and sincerity. On The Noyelle Beat, there’s plenty to fall for.